he is too cute! love the paper! Love your work and can't wait to start using the file. 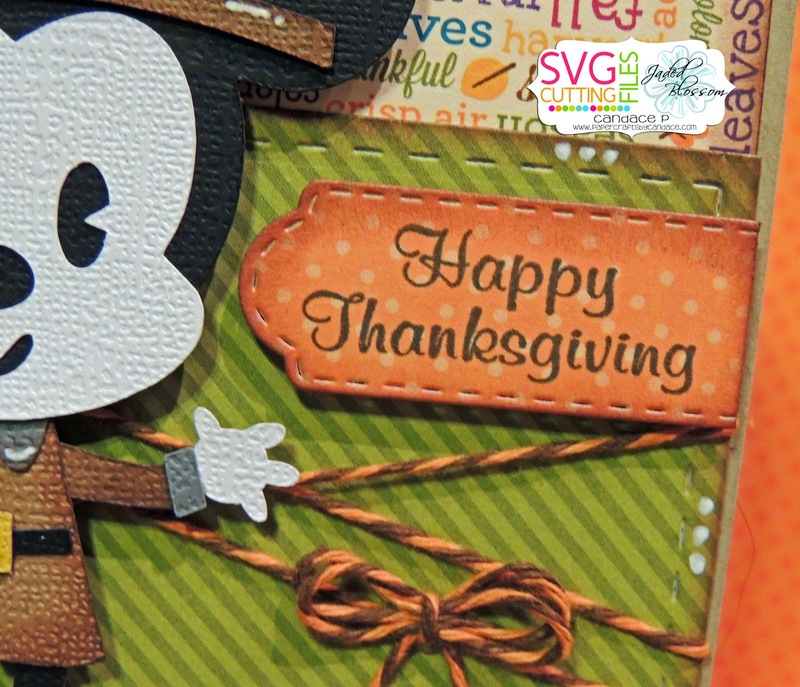 Your card is so cute -- love that Mickey matches pilgrim Minnie!! I LOVE your Mickey Pilgrim Card! Thank you! You always coordinate your paper and embellishments so nicely. How adorable. The cutest Mickey pilgrim. What a perfect finish for the hop! I love all the tiny details you did to just give this card that extra something special. TFS! omg... he is soooo cute... I love the card and all the details, the shape is awesome. Your Mickey is so cute! Love it! This card is fabulous. You have done a great job! This is fabulous! 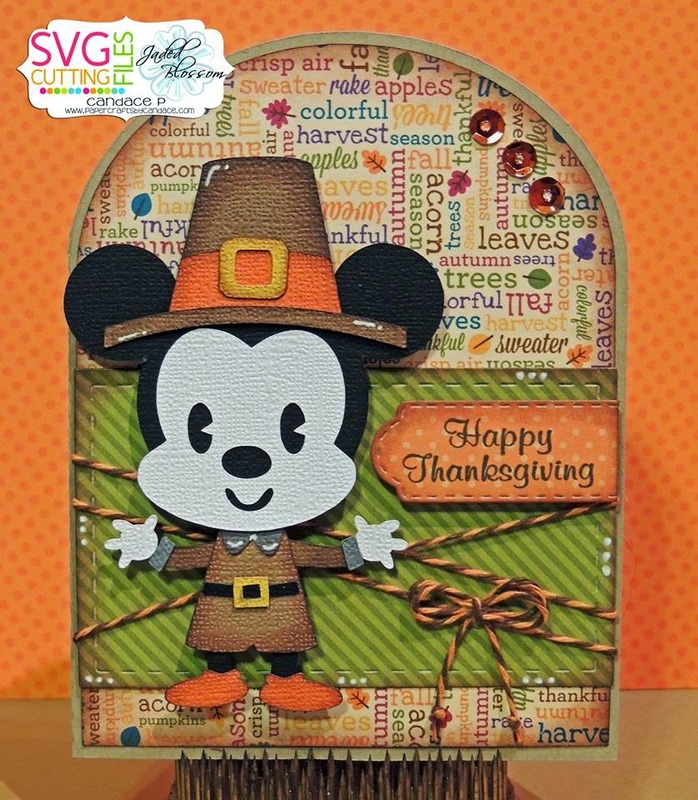 Love the rounded top card and that adorable Pilgrim Mickey! Now he is the sweetest pilgrim! love me some doodlebug paper!! and the mickey is quite cute too! Great job! Micky was awesome! Adorable. Did you cut him on white and color him? If so, very clever. I may try that next time. I am such a big Miokey Mouse fan. I love this. Mickey, the perfect pilgrim. Love it. Adorable! Love your colors and papers! Super job! Love Disney so everything is so cute!!! Thanks! Brilliant card! Love all the fall colors, and your added textures! Super cute card! Lovin' the fall colors and of course Mickey! Your Mickey card is fabulous! OMG!! You card is PERFECT!! ASOLUTELY PERFECT!! Love your Mickey. Awesome project. Thank you for sharing. Have a great crafty day. Love Mickey! And your card is fab. Love the papers. Perfect use of all your materials! Love the card. Awesome job! Love your paper choices! So cute! Thank you for sharing your cute project with us! Perfect pair to go with Minnie! Nice work! great display! love it! Great Blog hop. Thanks for sharing yours too. What a cute, cute pilgrim. Love your papers and colors. The tag with stitching is a great added touch. I am a follower...thanks for a fun blog hop! The paper is gorgeous. I have to try this one. So cute, I love him. thank you so much. Such a lovely Thanksgiving card! Love that twine...is is Orange Truffle from Trendy Twine? I have a spool of that color and LOVE it! Old School Mickey, too cute! Awwww Mickey is just too cute! Gosh, he is the cutest ! He and Minnie will be adorable together. Love this card and all the extra stuff you put on the card. Perfect complement to the Minnie. Love him! Another cute Mickey card. Thank you. This is the perfect match to the Minnie! Love your design. Thanks for sharing. love the paper and how it all ties together!!! Mickey is adorable, and I love your card! The background is great. Micky is fabulous! Fun papers and twine adds such a fun look to your card! Absolutely adorable! Spectacular card. Love all the details and the paper. Mickey is just super adorbs. Love Mickey!! Thanks for the great hop. Such a cute card! Love Micky! Your mickey card s so adorable! Awe Mickey looks so darn cute! I love the colors chosen for Hrs background as well. They make such an awesome background for Mickey to pop out. Love your choices and traditional Mickey! Love the colors and Mickey is just adorable! What a great hop!! Love this Mickey! This style is my favorite! Love the paper choices and colors. Oh such a cute Mickey!! So cute and I love the paper you used for this card-- love it! Too Stinking Cute!!! just love it! such an awesome job! Love it! Love the fall colors! So stinkin' cute and I love the card shape! The poster child of the hop, he's very cute. Happy Thanksgiving. Love this card. Another Thanksgiving card idea. Need to make different ones to send out. He is so cute! Love this! 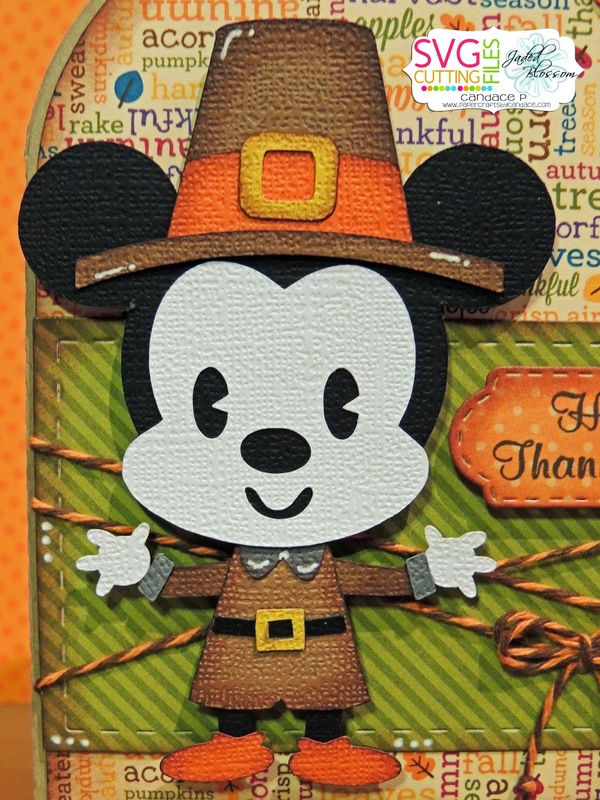 Super cute pilgrim Micky card! Amazing card! I love the added depth with the shading you did on Mickey's clothes. Your Mickey card is so creatively beautiful. Anyone would love to be the receiver of this card. This is soo stinkin' cute.. I cant take it!! Love all of the detail, great job! i love mickey mouse, such a great ending! Love your Pilgrim Mickey and your awesome card! This Mickey is sweet! I really love the little details you have added to make such a wonderful card! Another super cute Mickey!!! Love it! He's perfect! Love the card and the way you've embellished. This has been just delightful. Lots of cute new ideas for Thanksgiving. You gals are the best! Love your card, and Mickey is to cute! What an adorable Mickey! Thanks for sharing.